I've written over 150 books for young readers. To see the full list, click on the linke above. You can also see my books in print at Amazon, Barnes & Noble, Indie Bound, or GoodReads. Find the book that's just right for you or your young reader! Are you interested in having me come for a visit or a speaking event? Send me a message via my Contact Page. I'm eager to talk to you about it. 8/1/18—Kirkus Reviews, "[An] engaging tale of an unusual and spirited woman." 9/1/18 -- Midwest Book Review, "The Big, Bold, Adventurous Life of Lavinia Warren by Elizabeth Raum is an unreservedly recommended addition to family, elementary school, and community library biography collections for young readers ages 8 to 12. Lavinia Warren never let her height—or the lack of it—prevent her from leading a full and adventurous life. Although she never grew more than three feet tall, she became a beloved teacher, a world traveler, an entertainer and the friend of many powerful figures. Lavinia was teaching at a local school when she heard about an opportunity to travel doing shows as a "human curiosity" on a Mississippi River boat. Eventually she met P. T. Barnum and worked at his American Museum. It was there that she met Charles Stratton, a litter person known to the world as "Tom Thumb." Their wedding, which took place on February 12, 1863, brought joy to a nation at war. President and Mrs. Abraham Lincoln held a reception for the couple at the White House. The newlyweds later toured the United States and the world. Lavinia faced several tragedies but always found the strength to go on. Lavinia's extraordinary story also provides a social history of one of the most devastating periods in American history. With additional material on Tom Thumb Weddings, readers' questions, time line, and notes and bibliography, this is sure to be a valuable title for adventurous middle-grade readers. Radio Interview with Bob Harris about The Big, Bold, Adventurous Life of Lavinia Warren. The three books in this series of interactive Bible novels for readers ages 7-9 allow readers to become characters in the Gospel stories. Crossroads in Galilee lets you choose your journey as three children observe the life of Jesus and his followers. Every choice made changes the outcome of the story. Join these children as they learn about Jesus of Nazareth. When one journey ends, a new one awaits. The titles include: Christmas Crossroads, Crossroads in Galilee, and the latest offering -- Crossroads Among the Gentiles. In this "You Choose" book, you are living in the early 1770s. The seeds of revolution are growing in Great Britain's North American colonies. Rebel groups such as the Sons of Liberty have led protests against unpopular British taxes. Britain's government has reponded with harsh new laws that punish colonists. People had to choose their roles in the coming revolution. So does the reader. This interactive novel encourages readers to make choices as they read to determine what happens next. NEW FALL 2018. These illustrated nonfiction picture books describe how various animals build their homes. Titles include: Bears Make Dens, Beavers Bulid Lodges, Bees Build Beehives, Birds Build Nests, Orangutans Build Tree Nests, and Rabbits Dig Burrows. Available in English, Spanish, and French editions. Imagine that you are living in the 1770s. The American Colonies are revolting against British Rule. These books present readers with a unique view of the American Revolution. In the You Choose books, the reader becomes a character in the story, making choices that determine the outcome of the story. In the Timeline Book, readers get an overveiw of the entire Revolutionary period. These books work for both advanced and reluctant readers. Enjoy! Growing up is complicated! Do you ever wonder about social relationships? 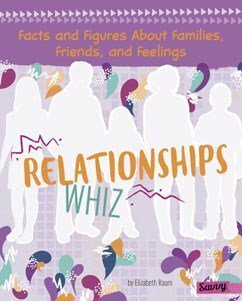 If you want to be the best friend and family members you can be, this book will help. How many siblings does the average girl your age have? At what age do most girls start dating? How do other girls your age handle friend drama? A companion book, Social Media Savvy: Facts and Figures about Selfies, Smartphones, and Standin Out seeks to answer your questions and more about how to make a statement on social media. All three of these books explore life in Colonial America. You may be surprised to learn about the daily lives of the colonists from their lack of doctors and medicines to their uncomfortable clothing to the animals running wild in the streets. Did you know that colonial people believed that the smellier the medicine, the more it helped cure what might be wrong -- or not!